•The city served as the seat of the Confederation Congress (former Second Continental Congress) and temporary national capital of the United States in 1783-84. • Annapolis is the home of St. John’s College, founded 1696. • It is the home of the US Naval Academy, established 1845. •Jeremy Friedel will move there in Summer 2018. Wait. Friedel…as in St. Mary’s senior Jeremy Friedel? Yes, Friedel was accepted into the US Naval Academy in Annapolis, Md., and will begin his journey to becoming an ensign and earning a degree in chemistry next summer. Talk about a small town kid making his mark. Only eight percent of Annapolis applicants are accepted into the exclusive four-year academy that educates officers for commissioning primarily into the US Navy and US Marine Corps. Friedel attended a summer seminar last year and was notified Nov. 13 of his acceptance. The application process is daunting in itself. Applicants must be triple qualified, having excelled in academics, physical activity and character. “Half of the admission process is getting a congressional nomination,” he said. That requirement was waived because Friedel has Navy in his blood. His father, Trent Friedel, is a Captain with 20 years naval service under his belt. This allowed Jeremy to receive a presidential nomination. “From him (Dad), I saw what I could do as a man, a father and for my country,” the younger Friedel stated. Jeremy visited the academy his sophomore year, solidifying his choice to apply, which he did as a junior. “One or two people you meet in life make an impact on you and change your life. Everyone there is like that. That visit changed me,” he said. June 28, he will leave Natchitoches to embark on his journey leaving a successful high school career where he did well in both athletics and academics He will become a plebe. Did your eyebrows rise as you asked yourself “What in the world is a plebe”? Plebe summer is a seven week course of physical and mental training Annapolis freshmen must complete. The stated purpose of Plebe Summer, according to the Academy, is to “turn civilians into midshipmen.” “It’s the equivalent of boot camp,” Friedel said matter of factly. A boot camp and a life journey he could not do alone. “Everyone at St. Mary’s, my family, friends and girlfriend, they’ve all been super supportive. The St. Mary’s family is very close knit.” His family has supported all his endeavors, including his penchant for donuts. How did we go from boot camp to donuts? Friedel’s character is symbolized by the round, deep fried, ok, or baked confection. He doesn’t eat them, well, not many anyway. He sells them. Every Monday morning, he buys donuts and resells them at school to raise funds for St. Jude’s. It’s an ongoing fundraiser he started 18 months ago. His efforts were recognized by the hospital recently when they sent a letter to the school. Besides his donuts, he also does community service at the nursing homes, VA, Special Olympics and is a Leo, a teen subsidiary of the Lion’s Club. Friedel also played football four years, basketball three years, runs track and is joining tennis. Jeremy Friedel does drills at a seminar last summer at the US Naval Academy in Annapolis, Md. All that accounts for his athletic and character requirements for Annapolis, but what about academics? He maintains a 4.0 GPA. He says faith is the biggest thing to him. “I talked to my priest about my decision. The way I see it, if Jesus Christ came to serve people, then what better can I do than to serve. It’s bigger than me,” he said. “I knew from the get-go I wanted to join the Navy. I just didn’t realize I wanted to go through the Naval Academy. I felt I was led to do more than the reserves.” So, off he’ll go in June amid congratulations from all his supporters. 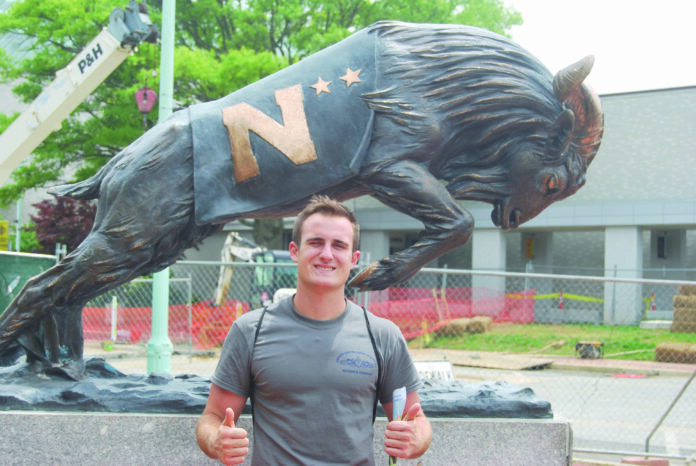 At the end of his four-year journey in Maryland, he plans to pursue the field of EOD (Explosives Ordinance Disposal) in service warfare or become a control room officer. After the Navy, he plans to use his degree in chemistry to become a nurse, yet again following in his father’s footsteps. “I can not begin to express how proud I am of Jeremy. His offer of appointment to the United States Naval Academy reaffirms that dreams can and do come true. Jeremy’s dedication and drive to attain his goal have been unrivaled. I’m so grateful to have a son that dreams big and wishes to use his talents to serve others by serving his country,” Trent said. This is one young man who has his act together, has the support system he needs to achieve his dreams and has the foundation in family and faith he needs to succeed. Jeremy Friedel, we’ll see you in your dress whites. Of this, no one has a doubt.